Be prepared with Easy Care! 1. Cuts & scrapes. 2. Blisters, splinters & stings. 3. Bleeding, wounds & burns. 4. Headaches & pain. 5. Sprains & strains. For fast & effective first aid. Sports. Outdoor. Family. Travel. Five pockets organized by injury. 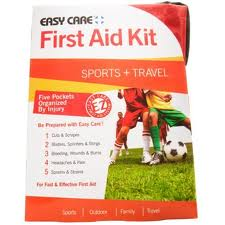 Ideal for: sports injuries; home first aid; workshop accidents; outdoor & travel first aid. Cuts & Scrapes: Adhesive plastic bandage 3/4 inch x 3 inch - 15; Adhesive plastic bandage 1 inch x 3 inch - 5; Adhesive knuckle fabric bandage - 2; Adhesive spot bandage 7/8 inch x 7/8 inch plastic - 1; Elbow/knee fabric adhesive bandage - 2; Antiseptic towelette - 20; Triple antibiotic ointment - 3; Butterfly wound closure - 2. Blisters, Splinters & Stings: Insect sting relief pad - 4; Moleskin - 1; Tweezers - 1. Bleeding, Wounds & Burns: Non-adherent pad 2 inch x 3 inch - 2; Cotton tipped applicator - 10; Sterile gauze pad 2 inch x 2 inch - 3; Sterile gauze pad 3 inch x 3 inch - 3; First aid tape 1/2 inch x 2.5 yds - 1; Medical grade gloves - 2. Headaches & Pain: Ibuprofen 200 mg - 2; Non-aspirin 325 mg - 4. Sprains & Strains: Elastic bandage 2 inch - 1; Instant cold compress - 1; Assorted safety pins - 3; Wooden finger splint - 2. We reserve the right to add, replace or withdraw items as needed.